Equine flu is a highly contagious virus that affects the respiratory tract of horses, donkeys and mules. It is very similar to the human flu virus, but not identical, so one cannot be passed to the other. As with human flu, it is spread through the atmosphere by infected animals coughing, and is then acquired by other animals inhaling the virus. It can also be spread indirectly via contaminated apparatus such as feeding buckets and even on the groom or handler’s hands and clothing. Equine Flu is very difficult to prevent as, like the human flu virus, it constantly mutates. Therefore, vaccinations only offer some protection against the virus. 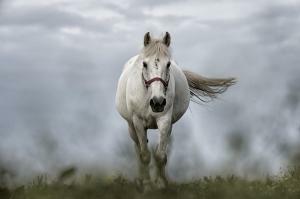 Horses that are frequently transported and mixed with other horses are more likely to be affected. A high temperature of 39-41C which persists for up to three days. A clear, watery nasal discharge. Enlarged glands under the jaw. Redness or discharge around the eyes. A harsh, dry cough that lingers for weeks. Lethargy and loss of appetite. If you suspect your horse is infected, contact your vet immediately and isolate your horse. Do your best to uphold strict hygiene at all times to avoid indirect spread of the virus. Carefully monitor your horse and don’t move them from the premises until the outbreak has resolved. How is Equine Flu confirmed? Your vet will observe the clinical signs and may even take nasal swabs and blood tests to confirm a diagnosis. Can vaccinated horses still be affected? Yes. As with the human flu vaccine, it will reduce your chances of contracting the virus, but it won’t offer complete protection. Vaccinated horses can still contract flu, but their symptoms are likely to be much milder than those of an unvaccinated equine. Rest and good stable ventilation are the two most important things for horses with Equine Flu. If you can, switch to dust-free bedding and feed soaked hay or haylage. Antibiotics will not be effective against the virus, but are sometimes prescribed to help treat secondary bacterial infections. As your horse starts to recover, turn them out for short periods at a time, providing the weather is good and their temperatures have returned to normal. If at any point you are worried, always consult your vet for advice. Not usually, but foals can sometimes succumb to fatal pneumonia so require greater monitoring.